The Cartier Fine Watchmaking Collection has become one of the most closely observed in the world of horology, and with good reason. 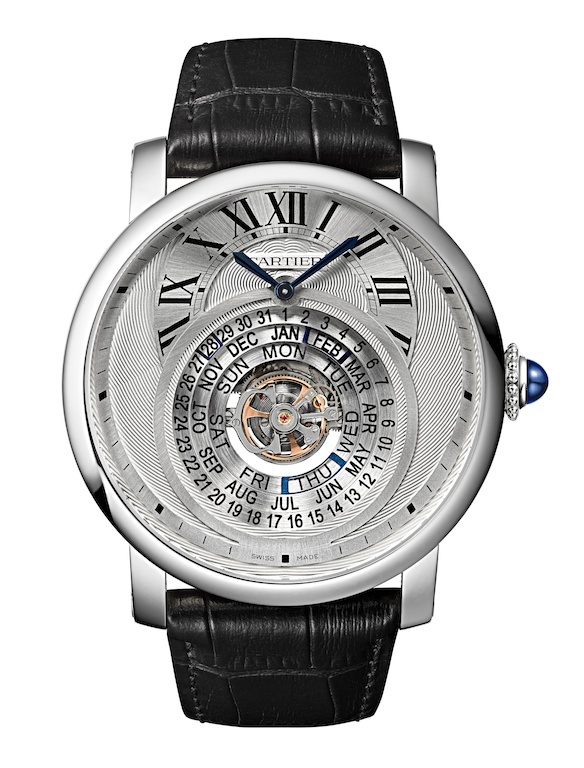 In the relatively short time the Collection has existed as a particular range of timepieces –with models representing all of Cartier’s major design families, and united by a common theme of high craft, innovation in complications, and sophistication in design that reflects Cartier’s long history of leadership in creating some of the most iconic watches and clocks ever made. This year is no exception. In advance of the full reveal of Cartier’s complete new range of watches, which will be shown at the SIHH in January, we’ve had the privilege of being able to preview –and to share with you –three of the most spectacular new timepieces Cartier will offer in 2014. The first is a new complication from the fertile (and apparently inexhaustibly creative) mind of Cartier’s chief movement designer, Carole Forestier. 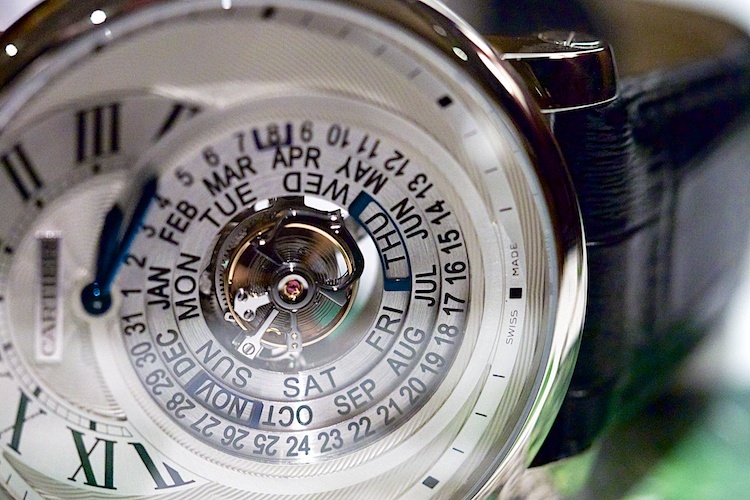 The Rotonde de Cartier Astrocalendaire is a perpetual calendar with flying tourbillon, which incorporates a remarkable new display for the calendar, as well as a most ingenious system for implementing the perpetual calendar function. The design of the watch, however, isn’t meant to offer a lesson in theatrical terminology or Greek etymology; rather, it’s a reflection of a very special design goal. In creating this watch, Cartier set out to make a perpetual calendar which, unlike a classic perpetual calendar, does not use a system of levers, star wheels, jumpers, and a central four year program wheel to control the perpetual calendar display. It’s a compact and ingenious system, and while technically it does rely on leaf springs to control the position of the three moveable teeth, the pressure they produce is so low and the corresponding friction (and variations in friction) so minimal as to be negligible. The result is that the Astrocalendaire offers an improvement overall of about 80% in balance amplitude over that in a traditionally constructed perpetual calendar when the indications are switching –especially useful in a perpetual calendar which also contains a tourbillon. This is important, you’ll remember, because balance amplitude is directly tied to accuracy –if the balance amplitude falls too low, positional rate variations become exaggerated and accuracy suffers. The Astrocalendaire is, we think, a great example of what’s become a very characteristic approach for the Fine Watchmaking Collection –a very innovative and interesting technical solution that serves the purpose of creating an extremely original and highly characteristic aesthetic. The transparency, depth, and concentricity of the display are all Cartier trademarks, and while the aesthetic achievement is remarkable, there’s also some real watchmaking going on here –of a very sophisticated kind. 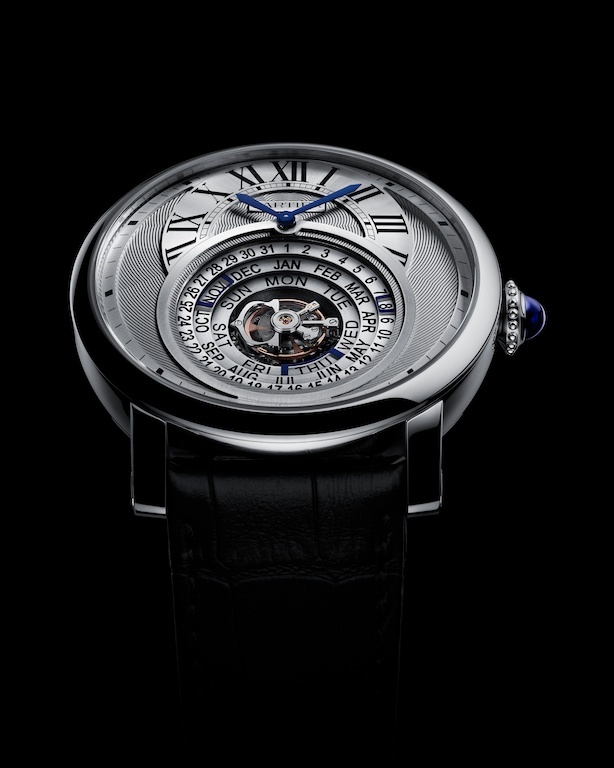 It’s all the more impressive that this was done without having recourse to modern exotic materials like silicon –the Rotonde de Cartier Astrocalendaire carries the Geneva Seal. 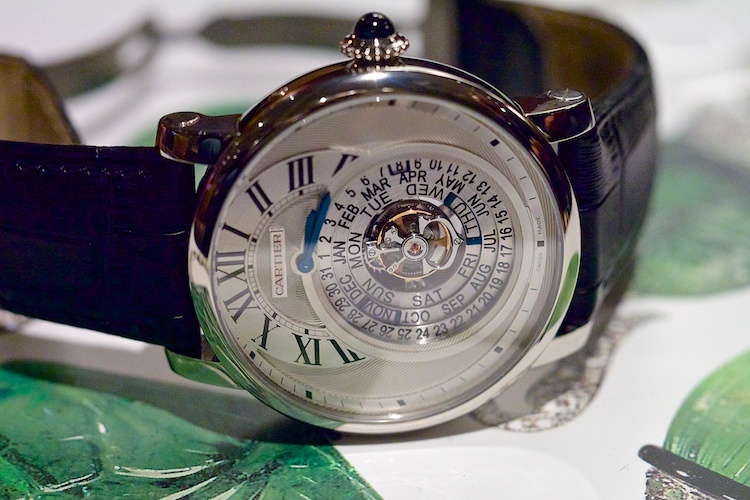 The Rotonde de Cartier Astrocalendaire is a limited edition of 100 pieces worldwide; 45mm Rotonde de Cartier case in platinum, 45mm x 15.1mm. 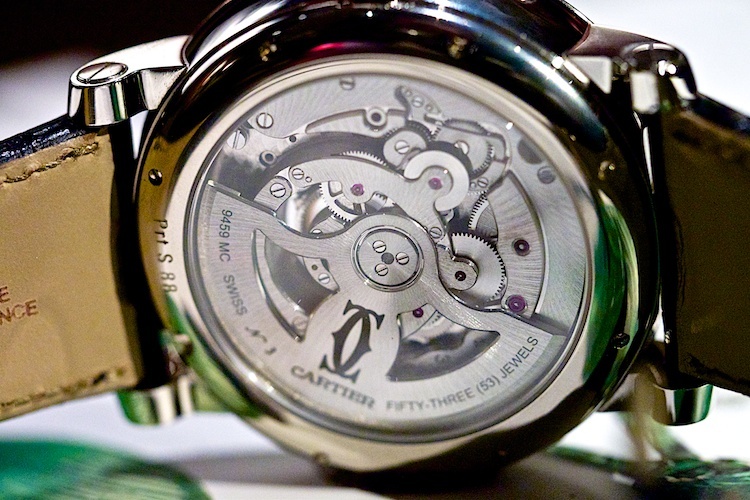 Movement: calibre 9459 MC, with Poinçon de Genève, 21,600 vph with power reserve of 50 hours. Movement diameter 32mm. Price: € 150,000.